In this new idea for multi-storey residential buildings - I call it the “High-Rise Honeycomb” concept - every resident can step out of her main door to her front yard and beyond that, a landscaped courtyard – or “sky-court” with a garden fence off the edge. The doors lining the courtyard on the right are the front doors to the apartments. All apartments in this “neighbourhood in the sky” will have such doors, leading into a lofty six storey high sky-court which contains private and shared gardens. How do the floors above the courtyard level – and there are five of them – get their access to their 6 storey sky-court? And will the cost of providing this lavish looking green courtyard in the sky be exorbitant? Let’s begin with the first question. How is it done? The illustration above explains the problem to be solved. These are two sky-courts on the same floor. To be six storeys high, they have to be flanked by 6 storeys of apartments. There has to be a central lobby with lifts and a fire-fighting staircase. And escape staircases. How indeed can each one of the six storeys of apartments get direct access to a sky-court? Let’s look at a portion of this plan, to a basic module. 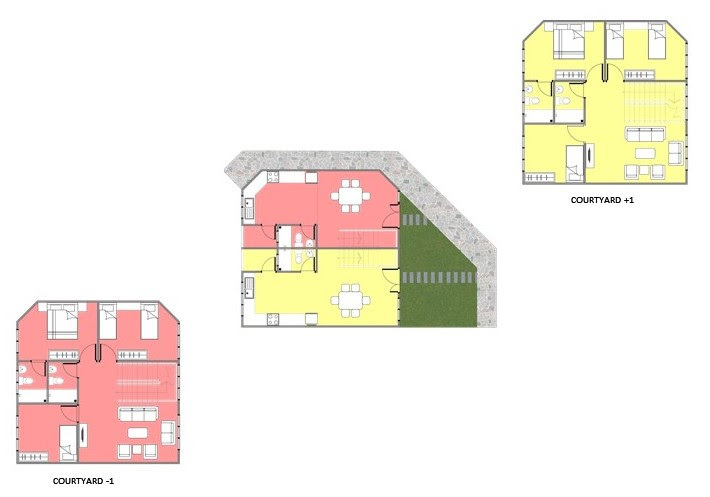 The basic module in this layout comprises two double storey apartments which occupy three floors, one placed on top of the other such that access to both apartment units are on the courtyard level, with one unit connected to another floor above the courtyard level and the other apartment is joined to the floor below the courtyard level. This is looking at the pair of apartments from the front. As you can see the pair of two storey apartments take up three floors, but both can be accessed from the courtyard level. This is the same pair of apartments, but looking at them from the side. Stacking two pairs of these interlocking apartments on top of each other produces a three storey high sky-court. However stacking these apartments on top of each other such that the courtyards flip from one side to the opposite side produces a six storey high sky-court. 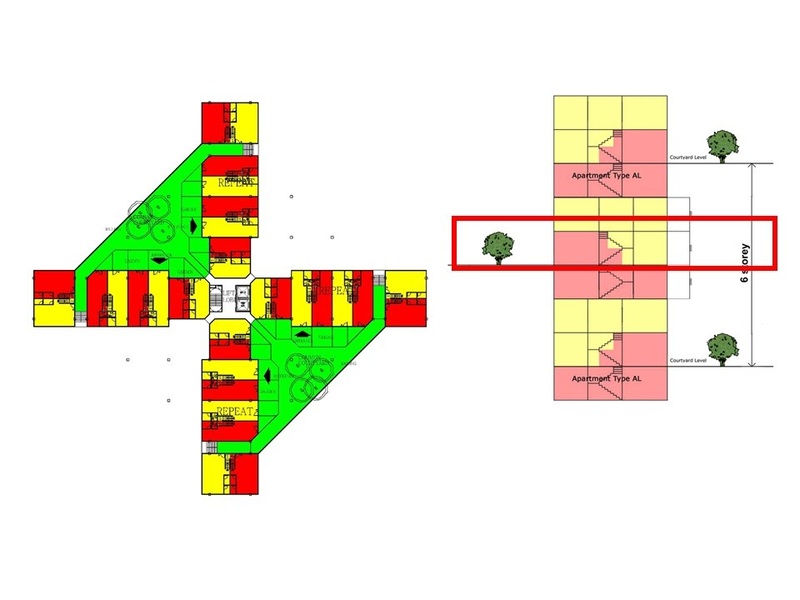 The illustration above shows how each floor in the six storey high sky court can open out onto its own shared and private gardens. The first floor above the courtyard level is part of a unit which is on the same level as the courtyard. The second and fourth floors are both linked to the third floor where there is another courtyard which is hidden from view. The fifth floor is linked to the courtyard one floor above it. This is a look at the floor plans. 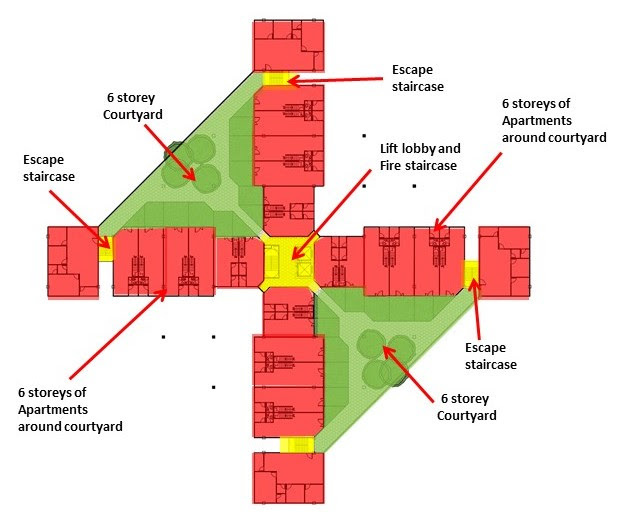 Apartments on the courtyard garden level either have stairs going down to bedrooms on the floor below (in red), or have stairs going up to bedrooms on the floor above (in yellow). In equatorial Malaysia, the blocks are best aligned North, South, East and West, such that all the four sky-courts would get sunlight. This design thus allows in plenty of light and ventilation but provides cover from direct rainfall. Each and every resident in this new type of apartment, can be afforded with a shared and a private garden and so the features of Honeycomb housing have been replicated for high-rise.